I haven't been spending tons of time in the garden this spring because all we've had is rain. Last summer I cut my neighbor's cedars that had spilled onto our garden and were making it very dark. Now it is much lighter, but it looks barren and I have been wondering how to fill it in. Earlier this spring I purchased some Elijah Blue grass and some Japanese blood grass, but then realized that this wasn't a very good choice as it would never grow very high and provide the privacy that I am looking for. 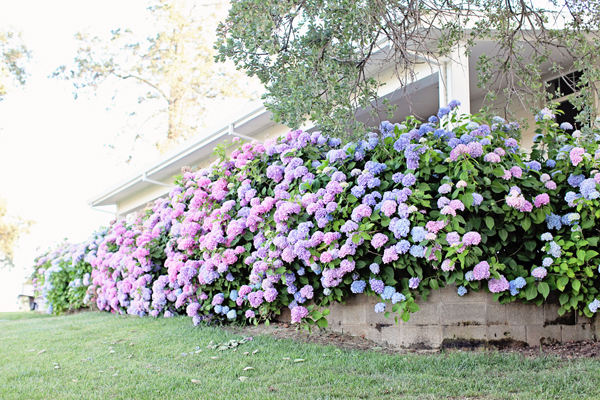 Then while I was looking at this web site, I saw the hydrangeas that were planted 6 years ago and realized that this is exactly what I am looking for. I went to Jardin Jasmin yesterday and purchased some hydrangeas. Hopefully they will take.